Imagine a future where astronauts aboard a spaceship, or exploring Mars, can leverage supercomputing power to conduct simulations, run artificial intelligence (AI) applications, collect, analyse and then transmit data back to Earth, in real-time, clearly and without delays. A future where space exploration missions can use high performance, commercial off-the-shelf computers that offer teraflop speeds in the harsh, radiative atmosphere of space, without the need for incorporating expensive and time consuming protective measures. This is the future that Hewlett Packard Enterprise (HPE) and the National Aeronautics and Space Administration (NASA) are envisioning as they launch HPE’s Spaceborne Computer on a year-long journey to Mars. The Spaceborne Computer, based on HPE’s Apollo 40 class systems, will be the first high performance commercial off-the-shelf (COTS) computer system to run one teraflop in space. Launched from Kennedy Space Center in Florida on 14 August 2017 aboard the Dragon Spacecraft, a SpaceX CRS-12 rocket, Spaceborne is bound first for the International Space Station (ISS) National Lab. Sending a computer to space isn’t a unique idea. In fact, computers have fundamentally changed and advanced space travel over the years. However, in the past, engineers would spend a considerable amount of time, resources and money to ruggedise and harden the computer enough to withstand the harsh environments of space that by launch time, the machine is usually already obsolete. 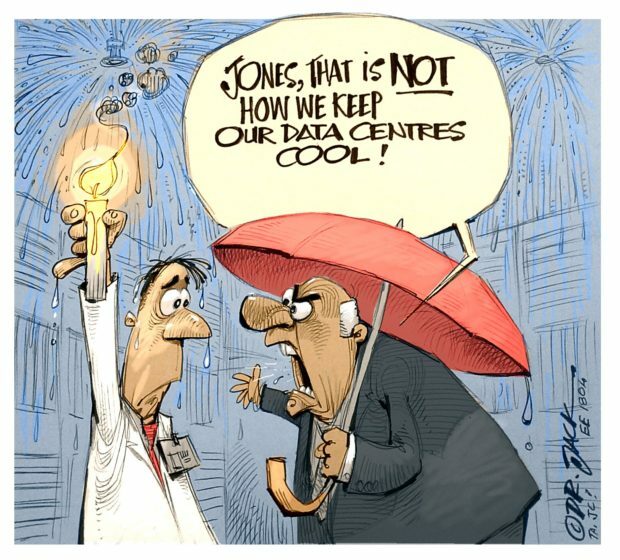 Think radiation, solar flares, subatomic particles, micrometeoroids, unstable electrical power, irregular cooling and a host of other environmental factors. Spaceborne is unmodified, safe for the addition of self-analysing and correcting, autonomous software; software which is designed to automatically “harden” the computer as it self-learns and adjusts to the varying conditions of space, mitigating environmentally induced errors. Even without traditional ruggedising, the HPE system still passed the 146 safety tests and certifications in order to be NASA-approved for space. Spaceborne includes the HPE Apollo 40 class systems with a high-speed high performance computing (HPC) interconnect running an open-source Linux operating system. 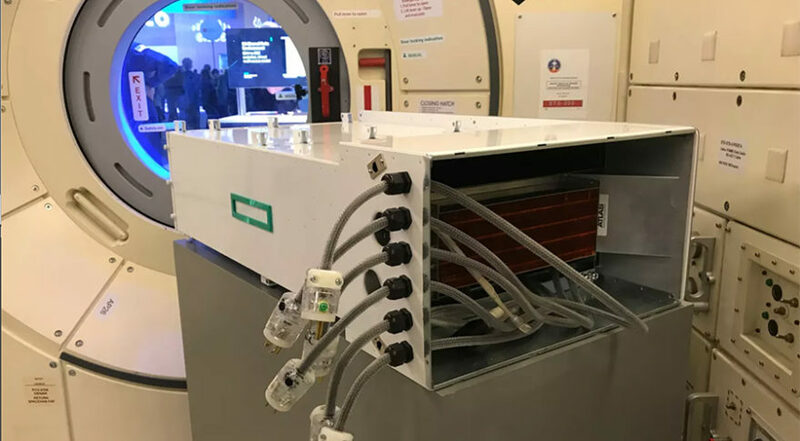 Though there are no hardware modifications to these components, HPE created a unique water-cooled enclosure for the hardware and developed purpose-built system software to address the environmental constraints and reliability requirements of supercomputing in space. Fig. 1: A replica of the Spaceborne Computer sent to the International Space Station in August 2017. Since the Spaceborne Computer is designed to address the in-situ needs of astronauts, and potential eventual space settlers, for experimental and other data processing capabilities, HPE will be running internationally recognised benchmark tests to simulate the wide variety of possible processing required. This includes compute-intensive, as well as I/O-intensive benchmark tests. Simultaneously, two of NASA’s own standard HPC benchmark tests will be undertaken. The project focus remains on off-the-shelf standards-based highest-performance servers that can run the wealth of applications anticipatable for astronauts on their long duration missions. The intention is to achieve a “hardening through software”, rather than through additional, heavy and expensive hardware. A mission to Mars will require sophisticated onboard computing resources that are capable of extended periods of uptime. To meet these requirements, technology’s viability in space needs to be improved in order to better ensure mission success. By sending a supercomputer to space, HPE is taking the first step in that direction. The goals of the mission are not reserved purely for space travel. Should the mission prove successful, the experiment will highlight that the equipment will be well-suited for any terrain, environment or project back home, on Earth. For both the local and international market, this means the likes of military, mining or other volatile environments will have the ability to use an HPE device to achieve real-time data at the edge and in-touch capability. For example, an engineer undertaking seismic testing can rely on the equipment to withstand tremors, eruptions, and more, reliably computing, analysing and transmitting data directly from the source. This dramatically shortens typical communication times and, with real-time analytics, could open up a world of possibility for disaster predictions, and can even mean the difference between life and death. This level of data-at-the-edge computing will allow businesses from every industry to reliably compute at the speed of thought, enabling them to make fast decisions, and respond to business trends more quickly than ever before.